Full disclosure: Noodles & Company was kind enough to send me some coupons for free noodles so that I could check them out. The free-ness of these noodles in no way influenced my opinion regarding their deliciousness. Noodles & Company is one of those magical and rare chain restaurants that actually caters to vegans. It’s like looking at horses off the side of the highway and spotting a unicorn. 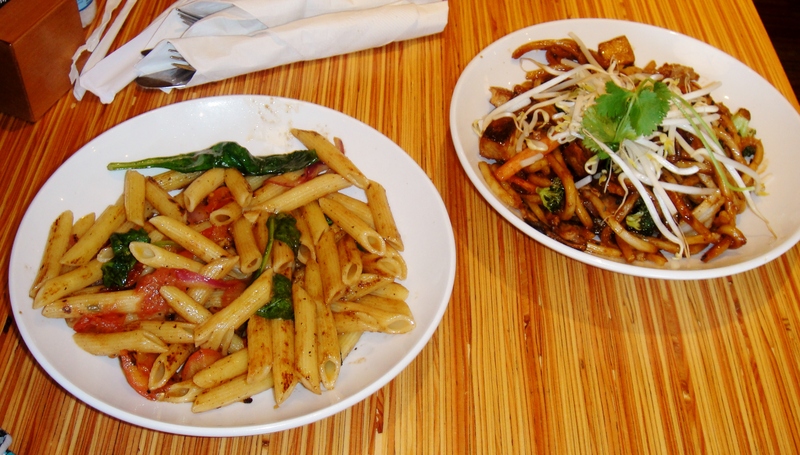 For one thing, you can add organic tofu to any dish at Noodles & Company. And I’m not talking about sad, flavorless, little white cubes. I’m talking about well-seasoned cubes that are cooked juuuuust right in a way I can never seem to replicate at home. Also, since all dishes are made to order, a lot of things that seem like they wouldn’t be vegan (say, a dish with a combo red-and-cream sauce) can be altered on the spot (omitting the cream and just using red sauce). And the vegetables! Such a bounty! Let’s take a look at what I ordered on this trip. The Noodles & Company menu is divided into geographical regions: American, Asian, and Mediterranean. The American section of the menu is not your friend, but between the other two sections there are seven vegan entrees along with two sides. How do I know what’s vegan, you ask. Because they freaking tell you. The list of vegan dishes can be found here, on the bottom right. The only thing better than an all-vegan restaurant is a restaurant that just straight up tells you what’s vegan. No asking confused/uninformed waitstaff, no having to check with the kitchen, no worrying about undisclosed animal ingredients … just the simplicity of ordering food. Love it. I got one Asian dish, Japanese Pan Noodles with tofu, and one Mediterranean dish, Pasta Fresca. 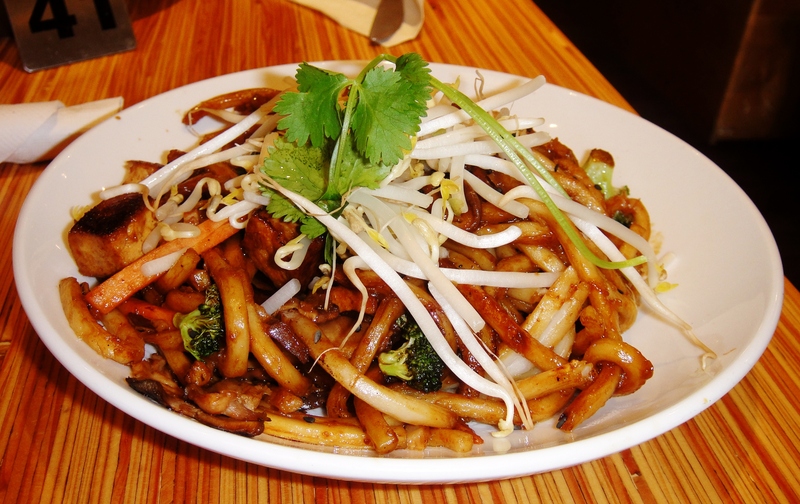 The Japanese Pan Noodles feature caramelized udon noodles in a sweet soy sauce with broccoli, carrots, and shiitake mushrooms, topped with bean sprouts, black sesame seeds, and cilantro. When they say “caramelized udon noodles” they aren’t kidding. These noodles were absolute perfection. I think we should caramelize more things. The veggies were super fresh and well-prepared – just the right amount of crispness. I raved about the tofu above but let me reiterate: delicious. As an added bonus, bottles of the wonder sauce sriracha are scattered about the dining room. For those of you who, like me, have considered bringing your own personal bottle of the rooster with you everywhere, there’s no need at Noodles & Company. Moving on to the Mediterranean section of the menu, I didn’t have particularly high expectations for Pasta Fresca. A simple dish of penne with balsamic vinegar, olive oil, white wine, roasted garlic, red onion, and spinach, I thought it would be tasty but nothing to rave over. I was wrong. This dish is FULL of flavor, mostly thanks to the balsamic vinegar. I basically couldn’t stop shoving this into my mouth. My only complaint is that I wish there had been a bit more spinach. The takeaway? I love Noodles & Company. The Green Hills location is close to my work and their online ordering system is my new best friend. Did you know that when you order online you can add as many vegetables to your dish as you want? The food here is delicious, filling, and infinitely customizable. One of my favorite dishes here (not pictured) is the Cucumber Tomato Salad, and now I never eat here without getting a side of it. Oh and they have one of those freestyle Coke machines. 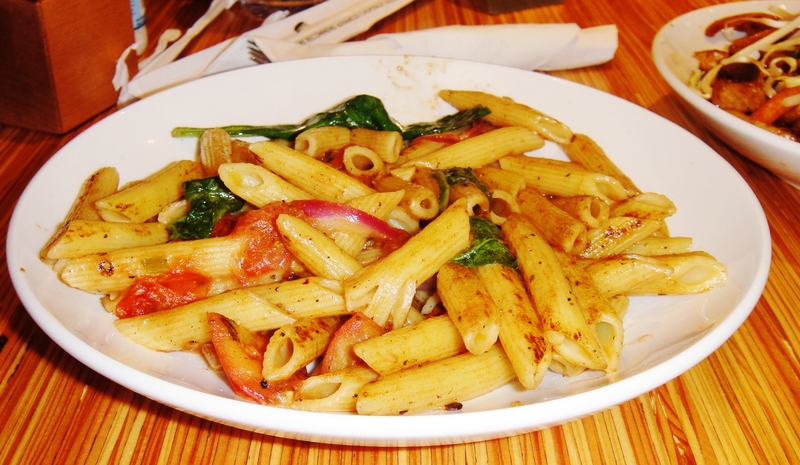 At Noodles & Company, get exactly what you want, and none of what you don’t. Greetings faithful readers, and welcome to Nashvegan’s first ever cookbook review, author interview, and giveaway! Unless you’ve been living under a rock for the past year, you’ve probably heard of Lindsay Nixon, better known as Happy Herbivore. Nixon is a prolific author and blogger who advocates for a plant-based diet that includes no added oils and only a few added fats from nuts and avocados. Her cookbooks Happy Herbivore and Everyday Happy Herbivore shot up the bestselling ranks on Amazon.com and now her newest installment, Happy Herbivore Abroad, is doing the same. Her publishers were kind enough to send me a review copy and they’d like to send one of you a copy as well! Details on the giveaway are at the end of this post. Nashvegan: There seems to be a current trend towards global vegan cookbooks (yours, Terry Hope Romero’s Vegan Eats World spring to mind) – why do you think that is? Happy Herbivore: I’m not sure. When I finished writing Everyday Happy Herbivore, I left for a long trip to Europe. While I was there I decided to write a cookbook that combined my lifestyle (my love of travel) with food from the places I’ve traveled too — it was about me and celebrating my passions (food + travel) together. I haven’t seen Romero’s book, but I imagine it’s quite different. NV: How does Happy Herbivore Abroad (HHA) stand out both from your other offerings and from other vegan cookbooks in general? My cookbooks (all of them) focus on being low fat, no oil — using whole foods, and basic ingredients, which makes them stand out from the vast majority of other vegan cookbooks on the market. NV: How are you handling life after Earth Balance? For many, it may feel like “life after cheese” syndrome all over again! HH: I never really got into Earth Balance. I wasn’t much of a margarine or butter person before I was plant-based and a huge motivation for my dietary change was health… Earth Balance isn’t exactly a health food 🙂 I also adopted the no oil/low fat whole foods approach early into my plant-based change, so it was something I just passed up. NV: What inspired you to come up with the idea of offering your plant-based meal plans? NV: What are your favorite plant-based “convenience foods” for people trying to live a low- to no-fat plant-based lifestyle? Basically, what would you recommend for vegans who need something grab and go, perhaps in a gas station? NV: Give us your top three favorite recipes from HHA. NV: After your previous career as a lawyer (this is a personal question for me because I have my J.D. ), how did you make the transition from lawyer to plant-based cookbook author? What sorts of practical challenges (student loan debt, etc.) did you deal with before your success, and how did you manage those challenges? I still have a mound of student loan debt crushing me — some $120,000 is left. I joke that it’s my summer home, since my law education costs more than what a friend recently paid for her house. The book business is not lucrative — even when you’re a best seller so we continue to live with less “glitter” than we had when I was a lawyer, but I’m so much happier and I’ve really come to love the minimalist lifestyle. NV: Why Los Angeles? How did you end up there? How do you like it? This is the second time we’ve lived in Los Angeles. You can’t beat the weather or the casual, California lifestyle but the traffic is ridiculous. LA without the traffic would be perfection. NV: I know a lot of my readers like to try to eat seasonally and locally. Is this an issue that you’ve given much thought? Have you considered writing a seasonal cookbook? HH: I too like to eat seasonally and locally (and living in Southern California makes that easy!) but it’s not really practical for a cookbook since what’s local (and seasonal) varies so much from place to place and I try to write books that are accessible to everyone — no matter where they live. That’s one thing that really frustrated me when I first changed my diet. The vegan cookbooks I bought used bizarre ingredients that didn’t exist where I lived or they were way outside of my price range. I think that’s why I try so hard to use “supermarket” ingredients. You shouldn’t have to live in LA or NYC to be able to cook up a good meal! So I’m sure now you want to know about the food. Well, wouldn’t you know it, I happened to cook some. I cooked two meals from HHA, totaling six recipes. I went on a Tour of Europe and then took a trip South of the Border. Who needs a Eurorail pass when you have HHA? This menu consisted of Swedish Meatballs, Irish Colcannon, and French Savory Glazed Carrots. One of the things I love most about Nixon’s cookbooks (I have them all) is that they all use “normal” ingredients and are easy to prepare. These recipes were all easy to follow, a breeze to prepare (if you don’t count all the time I spent chopping things), and of course turned out delicious. I cheated a little with the meatball recipe, which called for mixing the gravy with chunks of tempeh, and used Trader Joe’s frozen meatless balls instead (THE HORROR). First, I am a doofus and was so eager to get this on the plate and INTO MY MOUTH that I neglected to toss the meatballs with the gravy and instead just poured it over them. Following recipe fail. Whatever, they were still incredible. I am serious, this food was so good I could eat it every day. I couldn’t believe how much I loved the colcannon. As a person who believes that all foods are better when slathered with Earth Balance, I thought there was no way I was going to like mashed potatoes that were fat free. But guess what I INHALED THEM. And they’re full of freaking KALE. Talk about a nutritional powerhouse! In your face, margarine! The carrots had a great flavor but in my impatience I undercooked them a little. Ole! For my trip to Mexico I made AJ’s Pico de Gallo, Drunken Beans, and Migas. Despite my obsession with pico, I’ve never actually made it from scratch, mostly due to laziness. This recipe was easier than I thought it was going to be and I loved that it used shallots instead of regular onions because, let’s face it, shallots make everything fancier. I made this early in the day and then let it sit in the fridge until it was time for dinner so the flavors could marry and this was definitely the way to go. It tasted a lot better later. I’ve never heard of migas so I knew I had to make it. Migas is traditionally an egg-based dish with corn tortilla strips and veggies. I added nutritional yeast because I couldn’t make what was essentially a Mexican tofu scramble without nooch and I thought it added a nice depth of flavor. I’ve also never actually bought a poblano pepper, which this recipe called for. That worked out fine, too. Turns out they sell them in the produce department. Who knew. Anyway, on to the booze. Drunken beans are awesome. They taste like beer. I like beer. I like beans. I like beer and beans together. Seriously though, the smoked paprika really made this dish for me. Don’t skimp and just use regular paprika or you’ll be seriously missing out. Happy Herbivore Abroad is a really solid cookbook and it’s definitely going to be on heavy rotation in my kitchen. The recipes (and beautiful food photos) are interspersed with Nixon’s travelogue and personal stories. Everything is plant-based and low- or no-fat. Everything is made from “normal” ingredients that you can pick up in pretty much any grocery store, and there are no overly complicated cooking techniques. This book is accessible, flavorful, and not too shabby to look at. I highly recommend it. 1. Share this post on Facebook and be sure to tag Nashvegan. Leave a comment telling me you did this. 2. Share this post on Twitter using the hashtag #HHATour and mentioning @NashveganBlog. Leave a comment telling me you did this. 3. Be my special friend on Facebook and “like” Nashvegan. Leave a comment telling me you did this (or that you already liked me because duh we go way back). 4. Follow @NashveganBlog on Twitter. Leave a comment telling me you did this. So if you do everything you can get a total of five entries. FUN. Be sure to include a real email address when you comment so I have a way to tell you that you won. The contest closes at 11:59 PM CST on December 31. I will use a random number generator to select the winner. The winner will be announced on January 1, 2013, so long as the world does not end before that time. If I email you and you don’t get back to me within 72 hours, I’ll give the prize to someone else, so there. Who doesn’t love brunch? I know I do. But aren’t you tired of going out to a brunch spot with your friends and choosing from oatmeal (if that), dry toast (if that), and fresh fruit? I have the solution to your woes and it’s Fido. If you haven’t been to Fido yet, you’re missing out. This post is going to focus on brunch, but it’s awesome any time of day–their veggie burger is one of the best in town, I’m serious. They also have an awesome vegan cookies and muffins, as well as stellar coffee. 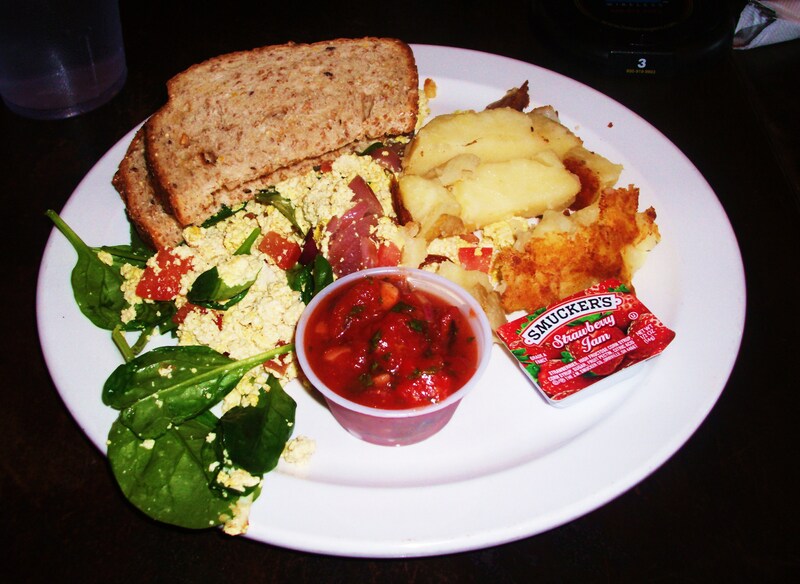 Plus, they serve breakfast all day, so you can get your tofu scramble on anytime. As you can see above, I had the Veggie Scramble with Tofu, sans cheese. Tofu can be exchanged for eggs in all of the brunch dishes, so a lot of them are easily vegan-ized. The Veggie Scramble includes tofu, baby spinach, tomatoes, and roasted onions, and man is it delicious! Seriously, it’s some of the best food I’ve ever had. It comes with hashbrowns (which are more like home fries than traditional hashbrowns) and toast with jam. There’s also a cup of salsa on the side, for making everything even more amazing. The veggie sausage is, unfortunately, not vegan, so don’t add a side of that to your meal. While not pictured, my dining companions and I also enjoyed some mimosas, which you make yourself–they give you the sparkling wine and orange juice and you combine away! I’m kind of a coffee snob. I mean, I’ll drink Starbucks because it’s, well, everywhere, but I don’t think it’s all that good. That being said, Bongo Java coffee is A-MAZ-ING. The only place I’ve ever had better is in Portland, OR. My favorite variety is Hair of the Dog, which smells better than any other coffee I have ever had the pleasure of enjoying. 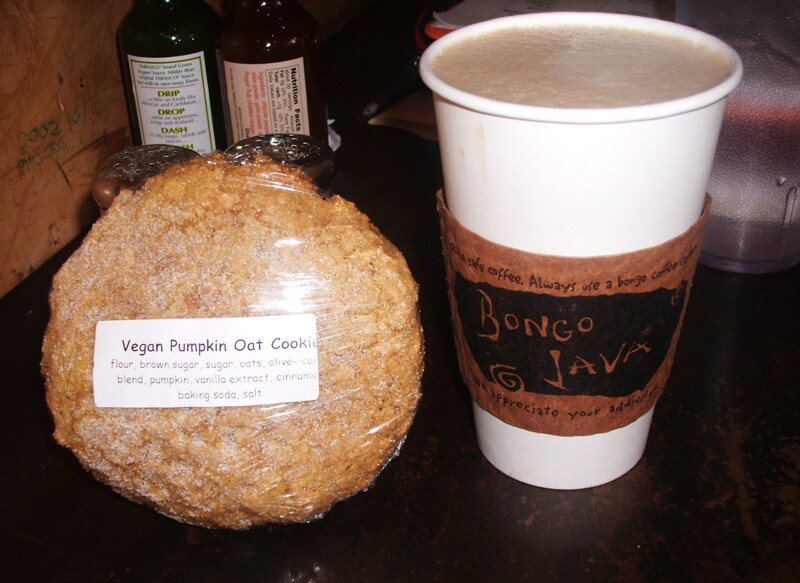 Also, the Vegan Pumpkin Oat Cookie: YOU MUST EAT ONE. Like, right now. I cannot get enough of these things. They’re soft almost like cake, and so moist and flavorful. They also have an amazing vegan hot chocolate cookie that’s spicy. And there are muffins, and other vegan baked goods. Bottom line: if you haven’t been to Fido before, you’re doing a poor job of being a vegan in Nashville. Go there immediately and get a tofu scramble, or a black bean burger, or some hummus, or a cookie, or a coffee, or all of those things. Do it now. At Khan’s, you decide EXACTLY what your dish will include. That makes it paradise for vegans. Khan’s Mongolian BBQ is on 4th Avenue, right next to the entrance to the Arcade. When you walk in, it kind of looks like a buffet. You can a choose a large or small bowl and then fill it up with whatever you want. They have tofu and TONS of fresh vegetables: sprouts, green peppers, carrots, white and purple cabbage, water chestnuts, snow peas, broccoli, onions, zucchini, mushrooms, scallions, baby corn, and more. Plus you get $1 off for getting a vegetarian bowl. You should see the art of architecture that takes place here–people build elaborate towers of food, cramming as much food as possible into the bowls. I have yet to master the art of making a bowl without anything falling out of it onto the counter or floor, but that’s okay because there’s always someone walking around refreshing the bins and cleaning up the messes made by people like me. Towards the end of the line are a wide variety of sauces and seasonings to make your creation complete. There are recommended recipes taped to the sneeze guard, but I usually just add a little bit of everything. A little goes a long way with all the sauces–if you add too much, your food will come out too liquid-y. It has taken me several visits to find the appropriate sauce-to-bowl ratio. Also, let me tell you, it is awkward to take photos of the food line in Khan’s. People must have thought I was insane. Once your bowl is complete, you approach the cash register and hand it over so they can cook it up for you. You get your choice of rice or noodles, but get the rice because the noodles are made with egg. The key feature of a Mongolian BBQ restaurant is the large metal cooking area; I read that it’s supposed to be reminiscent of Mongols cooking food on their big metal shields. If you ask nicely, the proprietors will cook your food in a pan in the back instead of on the big cooking circle thing, to avoid having your food cooked where meat was just prepared mere moments before. That’s what I always do. You get a little paper number and wait for your food to come out, and when it does, you are in for a serious treat. Rice, veggies, tofu, sauce, all made exactly to your specifications. And it doesn’t end there. Khan’s has an arsenal of delicious condiments you can use to top your dish. There’s soy sauce, duck sauce, sriracha, tabasco, hot sauce, and something delicious and brown next to the register in little cups. You can choose chopsticks or traditional utensils. I have to tell you, I’ve never had anything at Khan’s that wasn’t delicious, but the plate you see here was the best I’ve ever had while eating there. I think I finally got the sauce-to-bowl ratio right. Just writing this entry is making my mouth water. Khan’s is a seriously popular downtown lunch spot. If you show up just after 12:00, you’ll have to wait a while and there probably won’t be any tables left. If you can, try to head there a bit before 12:00 or a bit after 12:30. I’m glad to see that so many people love this place. I am absolutely certain that I will be back, just as I have been there many times before. The best thing about Khan’s? Every meal is different. Khan’s doesn’t have a website, but here is a blurb from the Nashville Scene. I love Bound’ry, even though this was only my second-ever full meal there. I hang out at the bar every now and then, and they can always scrounge up some kind of vegan appetizer for me. Plus, the bar has this awesome chilled section that you can set your drink on so it will never get warm. I like to leave my handprint in the frost, but I digress. I love the creativity of the menu, the willingness of the kitchen staff to make me special food that’s not even on the menu, the kindness of the servers and bartenders, and the awesome decor. I’ve never had a bad experience at Bound’ry. My birthday was a couple of weeks ago and I decided to have my birthday dinner at Bound’ry, partially because that’s where I had it last year (while still lacto/ovo) and partially due to The Traveling Vegetarian’s encouraging post about how vegan-friendly they can be. I made my reservation a week in advance and indicating that I was vegan. They assured me I could be accommodated, and boy was I ever accommodated. My server, who had celiac’s, and whose business partner was vegan, was awesome. He offered to whip me up a vegan appetizer but I declined since my dining companions were not getting any. I did take him up on ordering a salad, seen above. The Bound’ry Salad consists of Romaine lettuce, cherry tomatoes, crispy black eyed peas, and usually ham–remove the ham and it’s vegan. I chose balsamic vinaigrette as my dressing. This salad was great for being so simple. The dressing was just right (not too thick but not too runny/oily), and the crispy black eyed peas were an awesome addition. There was also an elaborate bread arrangement that I forgot to photograph, all of which was vegan. It was served with several different butters, but my server brought me out a dish of olive oil for dipping. My entree was not on the menu. In fact, there was nothing with tofu on the menu. When my server took my order for the entree, I told him I thought I would be having the Bound’ry Falafel since it was the only vegan thing on the menu. He stopped me and told me I could have basically whatever I wanted. This was too much choice for me, and while I stared at him dumbstruck, he asked if I would like something with tofu. I told him that would be perfect and off he went. I had absolutely no idea what would come out, and one of my dining companions expressed worry based on his experiences with chefs who do not know how to work with tofu properly. Was he ever proven wrong! This dish was AMAZING. Seriously. It blew me away. I’m not really sure what it was served with, beyond being able to identify the tofu (obviously), black eyed peas (not crispy this time), carrots, and what I think were summer squash and zucchini. I have no idea what that orange sauce was but it was delicious. Everything was incredibly flavorful, and that orange sauce really tied it all together. The tofu was the perfect texture–nice and firm on the outside and slightly softer on the inside. This dish was so filling that I could not even eat it all, which is saying something, because I can eat a lot. It also reheated well a few days later. One of my dining companions ordered the Bound’ry Falafel, so I had him snap a photo. It’s totally vegan and served with hummus, tabouli, naan, cherry tomatoes, and yummy roasted baby eggplant. This is your vegan standby on the Bound’ry menu and the most affordable entree. I didn’t eat any of this (too full from my own food) but I’ve had the hummus at the bar several times and can testify to its awesomeness. Honestly, I’ve never had any food at Bound’ry that was less than stellar and I’m sure this was no exception, and my friend who was eating it said it was great. Unfortunately, I was not able to snap a stellar photo of the dessert, but it was my birthday, get off my back. Bound’ry does not typically offer vegan dessert. I made my reservation a week in advance and spoke with Natalie, a manager, who told me she would discuss my vegan dessert request with the pastry chef and get back to me. She called me back a couple of days later saying they could accommodate me and asking if I liked pumpkin. I responded in the affirmative and that was it. My dessert came out with candles. I don’t really know what it was, but it was some kind of pumpkin custard-like substance. It tasted a lot like pumpkin pie filling, and it had nuts (pecans?) in it. There were also these little scone-like biscuit things, and fresh strawberries, and little chocolate sticks. I was so excited to have a vegan dessert, because this is the first real vegan dessert I’ve had in this city (I don’t count cookies as dessert–cookies are not a dessert, they are a snack). In sum, I love Bound’ry. They have an awesome beer selection and cocktail menu, the food is phenomenal, and the service is impeccable. It’s pricey, but totally worth it for that special occasion. They definitely made my birthday memorable. And I bet I’ll be back next year! I had an AWESOME time in Portland, Oregon. It is basically like vegan mecca. I can only imagine what it would be like to live in such a city, where fantastic vegan fare can be had at nearly every establishment, and nearly every establishment knows exactly what “vegan” means. I stayed in North Portland (NoPo) while I was in town, and as soon as I got in from the airport and dropped off my luggage my host and I popped over to Proper Eats Cafe for my first Portland meal. Proper Eats is a natural foods store and cafe, with produce and some groceries in the front and a dining area in the back. I was famished from spending six hours on and off various airplanes (but Southwest has some yummy vegan in-flight snacks! ), and I had to restrain myself from ordering basically everything on the menu. We started with the above Spicy Black Bean Quesadilla. It was stuffed with vegan cheese, spinach, and black beans. It was spicy, too! The salsa served on the side was incredibly fresh-tasting and helped to cut through the spice a bit. As you can see from the photo, it was topped with corn, red onion, and pumpkin seeds. Talk about awesome! When was the last time you had a vegan quesadilla? I don’t think I ever had one until this moment. I thought it was totally delicious, but it was kind of hard to eat–looking back, I should have used a fork and knife. I ended up getting it all over myself. For my entree I ordered the day’s special: Hazelnut-Arugula Penne Bake and Side Salad with Maple Balsamic Vinaigrette. Wow, that’s a mouthful! Seriously, this was SO. EFFING. GOOD. and I am still reminiscing about it. I wish I could get this at a restaurant in Nashville. I mean, I could probably cook something similar from scratch but who wants to go to all that trouble? The pasta was just the right texture. The cheese topping didn’t exactly melt right, but the flavor was great. The pesto was divine. The salad itself was pretty standard (spring mix, broccoli, carrots), and the dressing complimented it nicely. My host, an omnivore, had the Sesame Peanut Noodles. He loved it. The noodles are cooked in a peanut sauce and served warm with ginger lime tofu, all over a bed of spinach and garnished with asian slaw, broccoli and lime. You can see the little lime wedge in the photo, just waiting to be squeezed over the whole thing. He let me eat a little bit of it and it was even better than it looks in the picture. The noodles were perfect. The tofu was amazing. This whole dish was well-executed, well-presented, and well-made. It also kept well and made for an excellent second, reheated meal. If I lived in Portland, I would dine at Proper Eats Cafe all the time. The menu is varied, covering a lot of different types of food, and their daily specials are always interesting. They are almost entirely vegan (they offer a choice of a few dairy-based condiments), and every dish can be prepared vegan. If you have the good fortune to make it there, be sure to check the bakery case on your way out: I got a vegan chocolate truffle. Sorry, I didn’t take a photo. I know that next time I’m in PDX, I’ll be stopping by. Don't worry, the drinks are not about to slide off the table. So I have a backlog of restaurants I need to write about. I’m a busy student and don’t have the time to update the blog as much as I would like, and I always add restaurants in the order I visit them. This is an exception to that rule, because this place is SO AMAZING that I need to write about it immediately. Seriously, this restaurant completes my Nashville vegan trifecta of the BEST vegan food in the city: Suzy Wong’s, Mellow Mushroom, and Fattoush. You may disagree with me, and that’s cool, but I was blown away by this place. The first thing that struck me about Suzy Wong’s was the decor and intimate vibe. My dining companion likened it to restaurants in NYC, because the restaurant is long and narrow. There is an enormous patio out back which is perfect when the weather is nice. We dined inside, right in the window. It was a little strange having people look into the restaurant at us, but whatever. The space is impeccably furnished, with a variety of table set-ups and seating arrangements. The lighting was just right – not too dim and not too bright. And look at that adorable YUM plate! I want seven. Our cocktails were both fantastic. I had the Lychee Cocktail which consists of lychee vodka, lychee liquer, lime juice, and ginger ale. It even comes with a lychee fruit in the glass, which is totally delicious when you finish your drink. My companion enjoyed a Blackberry Mojito, which I tasted and also enjoyed. We determined that my drink complemented the food better than hers did, as it was lighter and crisper. They also have a pretty substantial wine list, and offer that awesome sparkling white that comes in the purple can with the bendy straw. I forget what it’s called, but it’s what they give you at Fido when you order a mimosa in the morning. We ordered two “Yum Bowls” and two “Small Plates” to be sure that we could sample a wide variety of foods. At the top of the photo is a plate of Vegetable Summer Rolls. This was the least impressive dish we ate. I just thought they were kind of flavorless, but my companion thought that might be because everything else on the table was so well-seasoned that they just seemed bland in comparison. The circular dish on the left contains Kung Pao Green Beans. When they say “Kung Pao” they’re not kidding – these beans pack some punch. They were fantastic. It was just beans and peanuts and what may have been french-fried onions and the sauce, but they were fantastic and I highly recommend you order them. Next is the Lemongrass Vegetable-Tofu Stir Fry. The mixture of vegetables in this was great, and they all tasted really fresh. It included red and green peppers, scallions, broccoli, carrots, green beans, water chestnuts (ew), and perhaps more that I’m forgetting. The tofu was nice a crispy, but I wish there had been more of it. Believe me, I saved the best for last: Vegetable Gyoza Pot Stickers. OH. MY. GOD. Seriously, it was like there was a party in my mouth and everyone, and I mean EVERYONE, was invited. My dining companion and I kept saying that we were going to come back over and over and order ten plates of these things. They are just simply perfect, and so is the sauce you dip them in and the crispy noodles that are served under them (because the crispy noodles stick to the pot stickers and you get a mouthful of different tastes and textures and awesomeness). Another component to my excellent experience at Suzy Wong’s was the service. My server was awesome and rushed to the kitchen to get answers to all my ingredient questions. He was also a vegetarian, so he totally felt my pain. We also got to chatting about veganism and the restaurant and life. He informed me that they will be updating the menu soon to clearly label all vegetarian and vegan options. My only complaint about the place comes from when I inquired about dessert. I wanted to see if there was a vegan dessert option, and it seemed like there almost might be, because they have a dark chocolate fondue served with strawberries and crystallized ginger. When my server went back to check on the vegan status of the fondue, he reported back that it had half-and-half in it. They also have a banana tempura thing with ice cream (the tempura batter is vegan), so I asked if I could have that without the ice cream. I was informed that this was not possible, because the owner is kind of a “soup nazi” and won’t make any changes to menu items. Disappointing, right? Well, don’t lose hope, because I told my server if the restaurant would be interested in serving a vegan dessert they would be heads and shoulders above other veg-friendly restaurants in the city. He seemed quite amenable to the idea and promised to discuss it with the owner. So, nashvegans, descend upon Suzy Wong’s House of Yum, eat enough pot stickers to make yourself sick, and stand up and demand your vegan dessert! ETA: Suzy Wong’s recently updated their menu with handy symbols indicating which menu items are vegan (and which are gluten-free). I absolutely love it when restaurants do this, as it makes it easier for me to order food and it shows that vegans have really come a long way. Unfortunately, the vegetable pot stickers and Kung Pao green beans are not listed as being vegan, even though I was told at the above visit that they were. Also, the edamame is not listed as vegan–I don’t understand how that’s even possible. I’m sorry for any misinformation I have provided, but on the visit above my server went to the back to ask the owner about everything I ordered so I thought I was in the clear. I guess not. How annoying.